Successfully Added Portable External Hard Drive (1TB, Black) to your Shopping Cart. External Hard Drive with 1TB (1,000GB) of storage space. A portable HDD that makes for a convenient and stylish way to take your photos, music, videos, and documents everywhere you go. USB 2.0 and eSATA certified, for the fastest read/write speeds you can get from an external HDD. Solid, high-density aluminum alloy enclosure with high compression resistance, impact resistance, corrosion-resistant. Professional design keeps it quiet and safe. Compact size, easy to carry, convenient, and stylish. 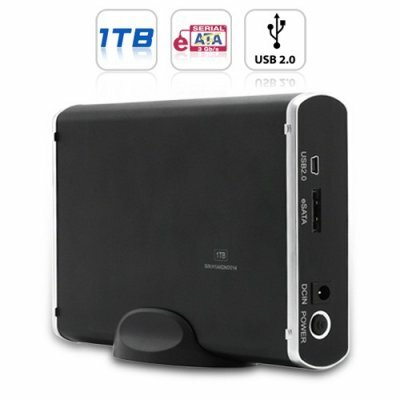 This 1TB Portable External Hard Drive is the ultimate data backup solution great for both personal and professional use. Available in our warehouse now, order today and we'll express ship it out tomorrow. Brought to you by the leader in China Electronics - Chinavasion. Exact model of HDD inside enclosure may vary from batch to batch, but guaranteed minimum specs as above. Can I replace the 1TB memory with my own hard drive? No, this is not an enclosure, it is purely a 1 TB external hard drive. There is a copy button on the front of my drive, what does it do? That function is for the model E90-Deluxe. For the standard model they serve no function. You can have it on your desk, isn't the big it seems to be.